This article details the different types of Whip Around users, the differences between them, and how to manage users. There are four types of Whip Around users: Owner, Admin, Manager and Driver. Admins have access to the Admin area, and can make changes to a Whip Around account which affects all users. Owners, like Admins, have access to the Admin area. Additionally, owners can access the Subscription just like admins as well. Managers have read-only access to your Whip Around account. Managers cannot make changes to a Whip Around account that will affect other users. Managers cannot access the admin area. They can edit the drivers and managers only in the teams they directly manage. Drivers only have access to the mobile app and can do inspections. 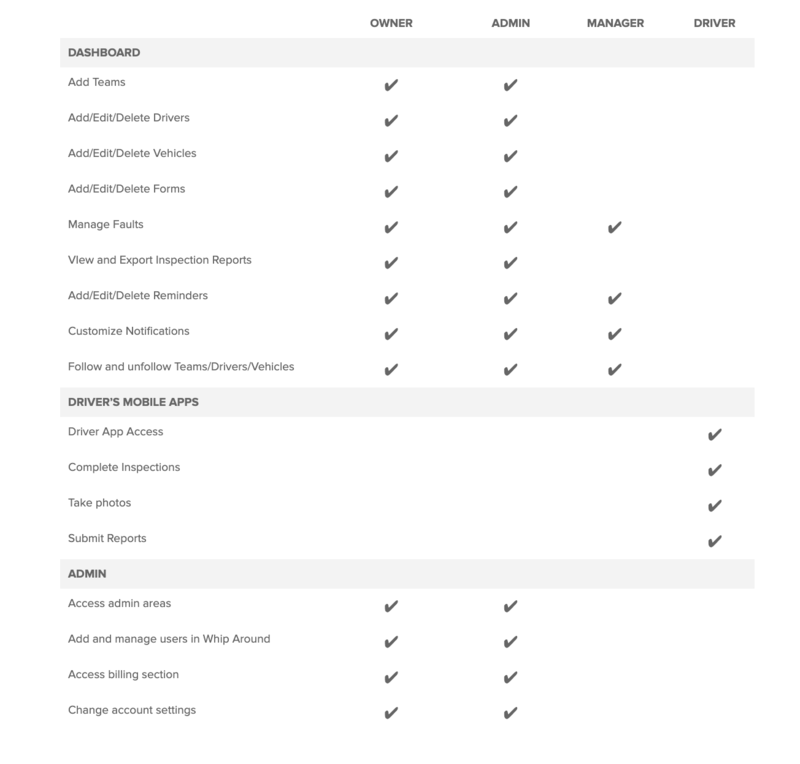 (If you have an Admin or Manager that needs access to the mobile app you will also need to add them as a driver). Owners can use their user name and password they signed up with for both the dashboard and driver's app. Owners and Admins can add, delete and manage users in Profile > Users. To add a user, navigate to Profile > Users, then select "Add new user". Enter the users' Name and Email and select a role then click "Add". This will send an invitation email to the new user with their password to login. To delete a user, navigate to Profile > Users, then click "Delete" in the row next to the user you would like to delete and confirm deletion. To change a users role or notification settings, navigate to Profile > Users, select the user you would like to edit, click the new role. The user has to make the changes to the notifications they receive. Click here to learn how to change the notifications settings. To request a change of account owner, please contact Whip Around Support at support@whip-around.com or message us through the chat button at the bottom right of this page.